How to Rip and Backup Blu-ray on macOS High Sierra? The new macOS High Sierra is about deep technologies that will provide a platform for future innovation while also introducing new technologies to make the Mac more reliable, capable, and responsive. High Sierra includes H.265/HEVC video encoding, which preserves better detail and color while also introducing much improved compression compared to H.264. For Blu-ray fans, it’s a wise choice to backup and rip Blu-ray to H.265/HEVC Videos on macOS High Sierra for playback on the go. Here’s how to do and keep on reading. Compatible with macOS High Sierra 10.13, macOS Sierra 10.12, Mac OS X 10.11 El Capitan, Mac OS X 10.10 Yosemite, etc. Native supports any kinds of Blu-rays: 2D/3D, 4K, 1080P, 720P, Disney, Copy-protected Blu-ray discs. Provides 250+ popular formats like: H.265/HEVC, H.264 mp4, mkv, mov, mpg, wmv, flv, 3gp, etc. video formats for playing on 150+ devices such as: iPhone (8, X), iPad, Galaxy Note8, Apple TV 4K, Android phone or tablets, Xbox, PS3/PS4 (Pro), etc. Remove all Blu-ray restrictions like AAC, BD+, CSS, Region, RCE, Sony ARccOS and PuppetLock. 1:1 entire copy Blu-ray to BDMV folder and directly copy Blu-ray main title. A built-in editor that allows you adjust video effects, trim, crop and add personal watermark, etc. For Windows users, if you want to rip/backup Blu-ray collections on Windows PC, please turn to Brorsoft Blu-ray Ripper for Windows. Install and launch the best Blu-ray Ripper for macOS High Sierra, and click “load disc” button to load your Blu-ray movies to this program. 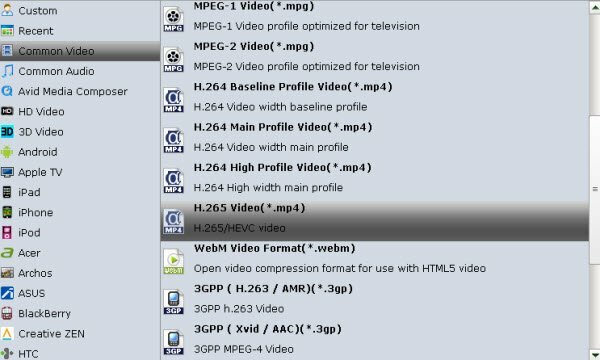 Click Format drop-down menu and pick up pick up H.265 Video(*. mp4) from Common Video or HD Video category as your output format, which perform best in macOS High Sierra. Or you can choose other presets according to your devices. Tip: If you like, you can click “Edit” button to do some editing work cropping, trimming, settings effect, adding subtitles. With all settings, click the “Convert” button to rip/convert Blu-ray to H.265/HEVC videos for macOS High Sierra. Once processing is complete, your video can be found at output folder on your Mac’s Hard Drive. Now you’re able to play the converted Blu-ray movies on your macOS High Sierra without hassle. This entry was posted in Blu-ray, Feature Post, How to, MAC and tagged backup blu-ray on macos high sierra, best blu-ray ripper for macos high sierra, rip blu-ray on macos high sierra. Bookmark the permalink. Thanks for sharing, it’s an useful tip.